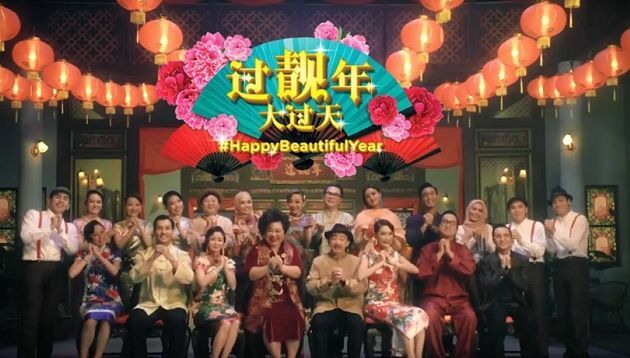 Watsons Malaysia is encouraging Malaysians to put aside their differences this coming Lunar New Year to celebrate a #HappyBeautifulYear together. Developed together with Naga DDB Tribal, the campaign features celebrities including Amber Chia, Pink Tan and Han Xiiao Aii and social influencer Justin Ng. The spot revolves around a Malaysian Chinese family based loosely in the stunning 1940s East meets West era, with a surprise twist on current trends. Typical to larger families, sibling rivalry is rife, sometimes escalating to a point that requires intervention from the parents. The story is told in a theatrical musical that’s filled with dazzling drama, stunning outfits designed by local designer Beatrice Looi, and a catchy song that incorporates a jazzy tango beat, trendy K-pop, and uplifting Chinese instrumentals in a seamless three-part composition. The lyrics also cleverly weave in Chinese lessons and advice into the song. The spot accumulated 1.1m views, 19k reactions, 1,063 comments and 7,790 shares on Facebook, as well as 2.4 million views and 5.5k likes on YouTube at the time of writing. The campaign is comprised of main film, TV commercials and product videos highlighting The Great Sale at Watsons. Additionally, Watsons also introduced healing and beautifying products through the film in a seamless and light-hearted manner, tying the spot back to the brand’s belief of “Look Good, Feel Great”. Paul Lim, deputy ECD at Naga DDB Tribal, said most consumers can identify with sibling rivalry. “Since CNY is all about family, it was a good time to address the issue, but in true Watsons wit, flair and energy,” he added. Besides the spot, Watsons also launched two contests for the festive period – Watsons Beautiful Year 2019 TikTok Dance Challenge and a chance to win RM888,888 worth of prizes. The dance challenge allows consumers to win prizes worth RM20,000 by posting a video of the Happy Beautiful Year 2019 dance using Watsons official song with the hashtag #HappyBeautifulYear2019, and uploading it onto the official submission website. 3 Hong Kong has introduced what it calls a "making better" research lab in an effort to address the decline in genuine human conne.. The photo-sharing network unveils plans to expand its offerings to advertisers, opening up possibilities for global marketing effo..